Eurovision could not have come at a better time. Are you jealous of my Eurovision overlay? (I suspect no-one else has used it for knitting!) Get the Eurovision App! I mean I know there's all sorts of Very Important Reasons for when it is on, but seeing as this blog is All About Me, I'll just stick to my important reasons. It's been a really hectic week with busy days and late nights doing all the usual mum things, and work things, and then some extra work things that required extra preparation. So I was definitely ready for a weekend of totally ignoring work responsibilities, and doing some things I love. We spent all day Saturday doing weeding and other yard work, and the Best Neighbours in the World (sorry, they're ours and we're not letting them go anywhere) helped us do all of it, while the Best Kids in the World (ours and theirs) played happily all day so we could. I am so very thankful for this little village we have right at home. It was so awesome to be outside in glorious, mild weather (sunshine and blue skies, where has Autumn gone?) doing something physical, and being able to stand back and survey our achievements at the end of the day. I'm still smiling over the garden beds. Plus I got to play with my power tool: the pressure washer - that's enough to make anyone happy! But, perhaps best of all, the evenings (and to be honest, some of the daytime too - we take our responsibilities of indoctrinating our children very seriously) were spent enjoying the spectacle of Eurovision. There is something miraculous about taking a ball of yarn and turning it into something: something useful, something fun, something warm. There is something therapeutic about the rhythm of the stitches and the click of the needles. 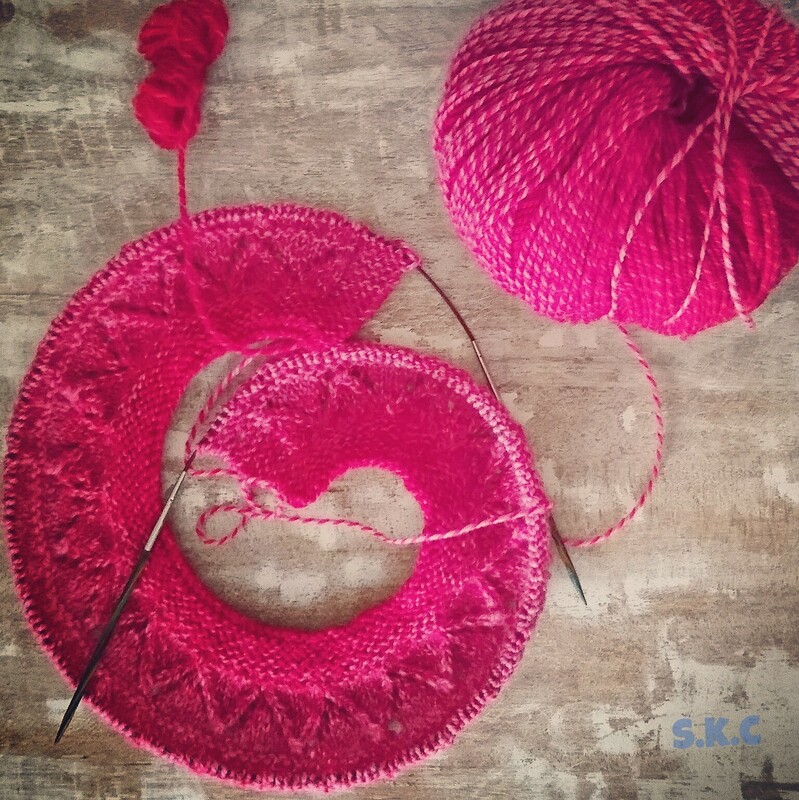 I recently read an article about the benefits of activities that force us to alternate between left and right handed actions: I think knitting would quality too. I have to mark off where I'm up to in the patterns! There is always something new to learn, which is hugely satisfying! There is something reassuring about redeeming empty moments - on a car trip, in the train, in front of the TV. I knit in phases. I often don't knit for months if I'm tired or it's hot. But other times, the knitting bug gets me, and I can't put it down. I stay up far to late to achieve the satisfaction of completion. Last year, Bendigo Woollen Mills released the most delicious yarn called Bloom. It sold out faster than you could say 'cosy sweater'. I was fortunate to get some in the teal (for princess) and in the red (for me). For Princess I knitted up the lovely Kina which is available on Ravelry, here. I found out about it from RetroMummy. 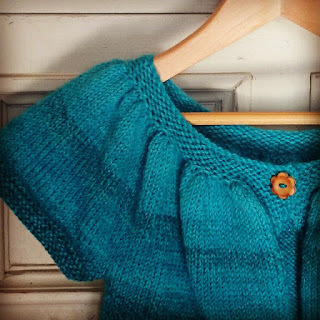 It was a lovely easy knit: knitted from the top down, with minimal seaming (only under the arms). It's well worth the 3 Euros (a cup of coffee?) for the pattern! It came up beautifully for her. 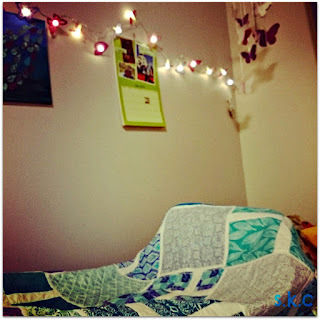 I was hoping to do the same for me in the Lady Kina, but got confused, and purchased a different pattern, My Favourite, from a wonderful Australian Designer Tikki Knits. 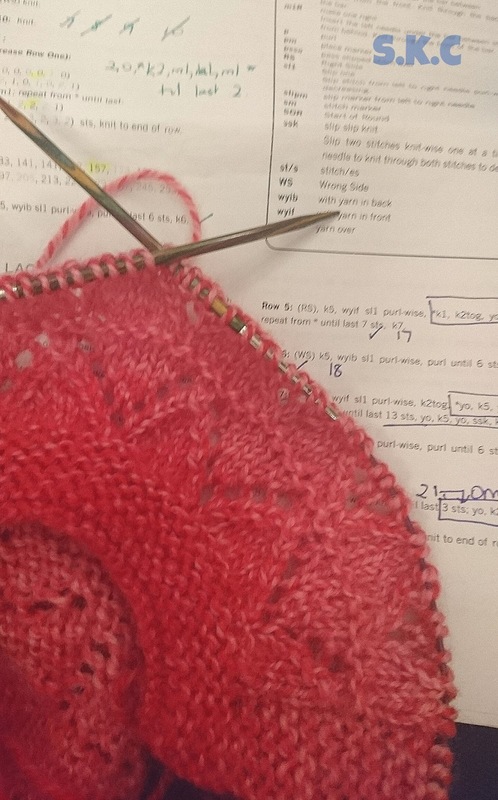 I'm now hoping that the My Favourite won't be beyond my skills; I do think that this pattern is nicer than the Lady Kina (although that is nice too!). I spent an evening working on a tension square, which showed me that I needed to go down a needle size. 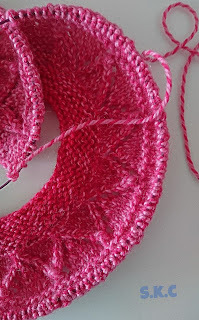 That meant I needed to quickly finish off another knitting project to liberate the correct needles..
Then I had to learn how to do a 'long-tail cast on'*. 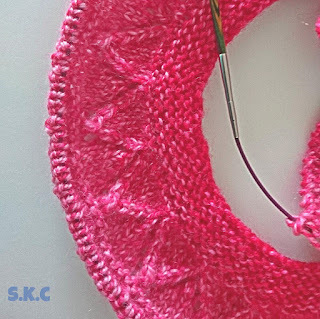 I found it quite different and quite difficult compared to my normal cable cast on, although I can see that it is quite a quick cast on because you only use one needle and your fingers to create the loops. The best video tutorial I found was this one, which showed nice and clearly how it works. If you are keen to attempt any of Tikki's patterns, find out why a tension square is a good idea, or why she recommends the long-tail cast on (and how to adjust your pattern if you choose another cast on), her blog posts on a baby cardigan knit along are here! I've learned so much just from reading these! While I'm talking about Tikki, I should mention the amazing patterns she is creating as part of the WARM / SEAM project, at the Art Gallery of Ballarat, about global warming. Knitters are submitting knitted squares, which will have Australian wildflowers, wind turbines, gum leaves added - all knitted! The ones she has done so far are simply delightful. The sum total for the first evening was that none of my cardigan is completed, as I had to rip (undo) my cast on and after several attempts at it, the yarn was splitting a little. I put the knitting aside, and started again the following day with fresh yarn and fresh energy. I've continued on the cardy whenever I've had some moments. 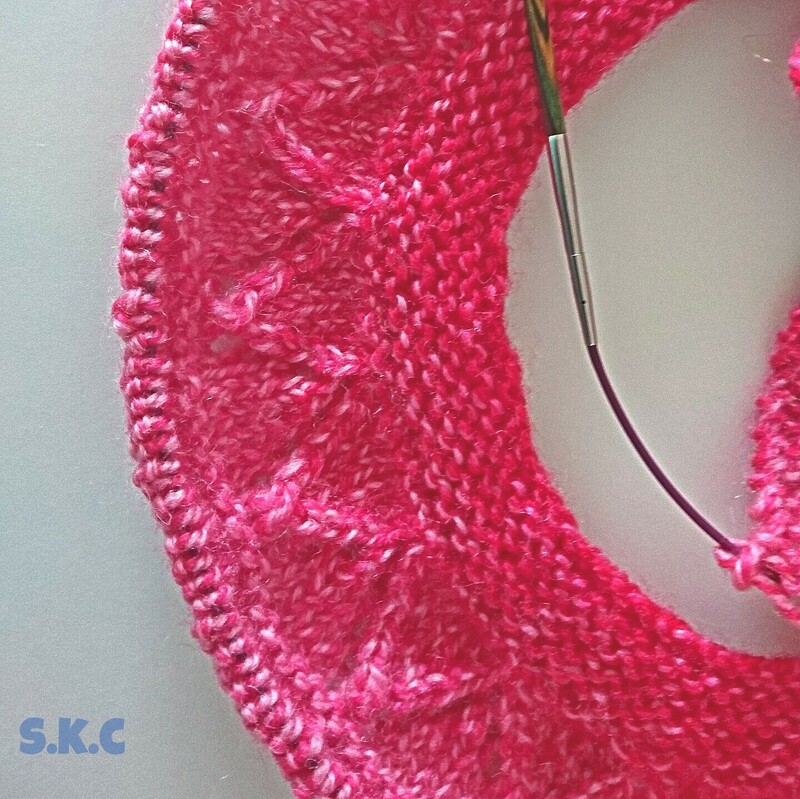 I'm a slow knitter, and there's quite a few stitches (being an adult's cardy) so each row takes a while. And it really is a case of 2 steps forward, 1 step back, as I've had to do a lot of tinking (backwards knitting, get it - it really is a word!) and a little ripping (pulling it off the needles and undoing it. The pattern isn't difficult, but concentrating and remembering all the stitches in the lace pattern has been a little tricky for me. But I'm learning a lot, and I'm starting to see some progress. I've nearly finished the yoke lace section, and then the knitting becomes a little faster. Except that there will be 300 stitches on the needles! I'm sure I'll be updating you with progress along the way. Just be prepared to wait for a while! 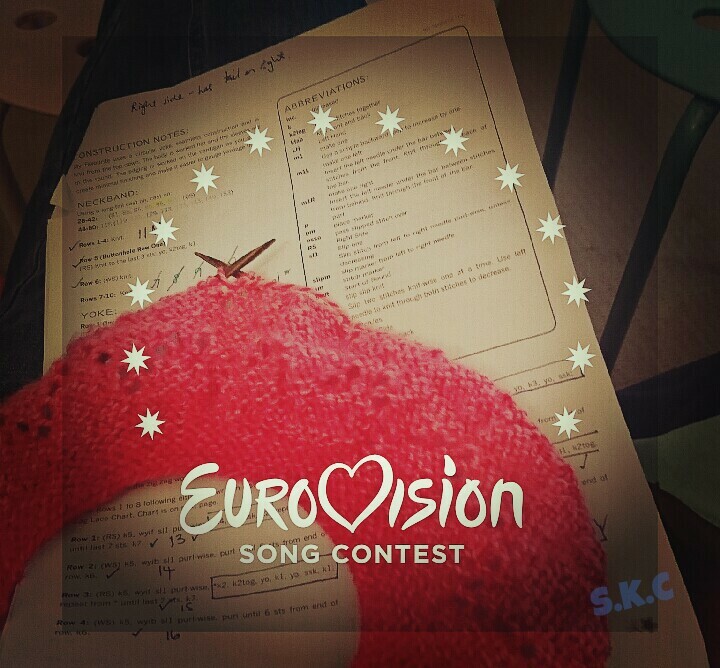 And I'm quite thrilled that I'll be able to use Eurovision as a handy teaching resource too. That's the kind of work preparation I love! * I really hope you enjoy the Outlander reference there if you followed the link! Finally some sewing... and it's for boys!